HT8G Power Units and S2 pumps built in Ken Reim’s garage for an order going to Sierra Leone for the Peace Corp.
Hydra-Tech designs and supplies Stainless Steel 18” axial flow pumps to Occidental Chemical for use in Florida phosphate mining. Hydra-Tech now supplies three and four inch pumps to Vacuum Truck Manufacturers for use as flange mounted decanting pumps on vacuum trucks. 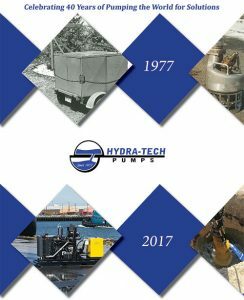 Hydra-Tech’s single largest order to date, 26 pumps and 13 twin circuit power units are shipped to Brazil through a US distributor. Complete line of shredder pumps introduced. Design and Testing of 24” Axial Flow pump complete.